Ichiro Suzuki’s career has come full circle. Suzuki started his professional baseball career in Japan in 1992. Twenty-seven years later, he decided to call it quits in Japan. 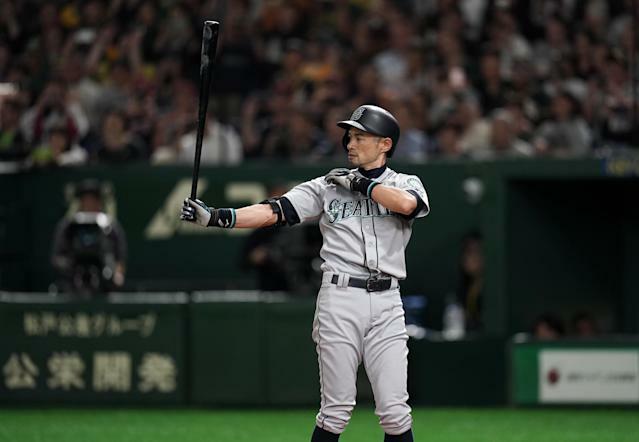 The 45-year-old Suzuki announced his retirement following Thursday’s game between the Seattle Mariners and Oakland Athletics. As expected, he got the start in his final game. He went 0 for 4, popping out in foul territory, grounding out to second, and striking out looking. And then, in the top of the eighth inning with a runner on second, the “True Hit King” grounded out to short, just barely failing to beat it out. 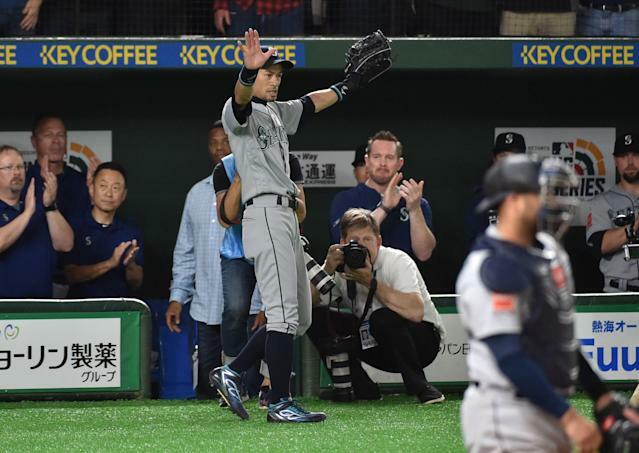 Suzuki took his position in right for the bottom of the eighth before all the Mariners left the field, giving Suzuki a final, international, ovation. The crowd was deafening. Dee Gordon cried, so did Yusei Kikuchi, who was making his major league debut. The Mariners won the game 5-4 in 12 innings. After the game, Suzuki released a statement through the Mariners. Suzuki’s decision to leave baseball may come as a surprise considering he’s stated he wanted to continue playing until he’s 50. Suzuki was also adamant that he was aiming to play for the Mariners throughout 2019, not just two games. When Major League Baseball announced the Mariners would open the season in Japan, many expected Suzuki would receive playing time for those two games. Given that Suzuki played just 15 games in 2018, some speculated Suzuki would retire immediately following the series in Japan. Those predictions turned out to be correct. Suzuki leaves the game as a sure-fire Hall of Famer, and one of the most important players to ever step foot on a baseball field. Suzuki was not the first player from Japan to play in MLB, but he had the biggest immediate impact on the game. As a 27-year-old rookie, Suzuki hit .350/.381/.457 over 738 plate appearances. He won the Rookie of the Year award, was named the MVP and led the Mariners to a record 116 wins. Suzuki dominated MLB over his first decade in the United States. From 2001 to 2010, he hit .331/.376/.430. In that period he made 10 All-Star teams, won nine Gold Glove awards, earned three Silver Sluggers and finished in the top-10 of MVP voting four times. His success paved the way for many other talented players from Japan who wanted to test their skills in MLB. Yu Darvish, Masahiro Tanaka, Kenta Maeda, Shohei Ohtani, Hideki Matsui, Tadahito Iguchi and Daisuke Matsuzaka, among many others, made their MLB debuts after Suzuki. Suzuki saw his numbers start to decline in 2011. Due to his late start, he was already 37 years old. During his eight seasons leading up to 2019, Suzuki hit .268/.310/.343. He hung around as a part-time player and pinch hitter well into his 40s. Though Suzuki didn’t play in the majors until he was 27, he still managed to rack up over 3,000 hits in MLB. If you combine that with his hit totals from Japan, no professional baseball has more hits than Suzuki. He is, at the very least, baseball’s international hit king. He was also a character. Throughout his 19-year career in the majors, Suzuki developed a reputation as one of the biggest personalities in the game. He became famous for his profane speeches before All-Star Games, created his own inappropriate American expression in an interview with Bob Costas and casually dropped an expletive the first time he met Pedro Martinez. He loved swearing, apparently. On the field, Suzuki dazzled before games with his outfield routine. He would play to the fans, regularly catching balls behind his back. He also impressed more than a few teammates with his power displays in batting practice. One of baseball’s biggest urban legends was that Suzuki could have won the Home Run Derby. That theory was never tested. Now that Suzuki has retired, the countdown clock for his Hall of Fame induction can officially start. Since he played two games during the 2019 season, however, Suzuki won’t be eligible for induction until 2025. When the time comes, Suzuki will coast into the Hall of Fame during his first season of eligibility. Considering his contributions to the game, he could join Mariano Rivera as a unanimous inductee. Suzuki undoubtedly enhanced the baseball experience for fans, players and teams. His exit leaves a considerable hole in the sport, but his legacy ensures his presence will live on in the countless number of players he inspired along the way.